Change the admin user account on Windows 10, you can do this via the User Account Control or Local Users and Groups Manager! 1.) ... Change the Windows 10 admin via Local Users and Groups Manager! 2.) ... Use User Account Control to change the Windows 10 administrator account! 3.) ... Change User Account to administrator account via netplwiz! 4.) ... Change a user account type using Command Prompt line! 1.) 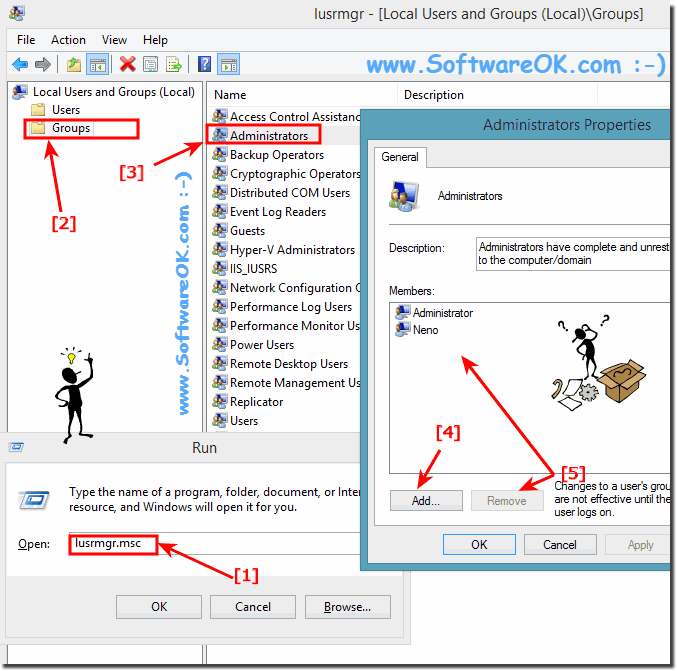 Change the Win 10 admin via Local Users and Groups Manager! Please start the Local Users and Groups Manager via lusrmgr.msc commamd from Windows 10 run dialog! to change the Windows 10 Home administrator account ! (Image-1) Add administrator in windows 10! And now click the button Advanced in select user Window Find Now. Double-Click on new Admin User an click OK Button. On Windows 10 is an administrator account is a user account that lets you make changes that will affect other users. Administrators can change security settings, install software and hardware, and access all files on the Windows 10 computer. Administrators can also make changes to other user accounts on Windows 10. When you set up Windows 10, you will be required to create a Windows user account. This account is an administrator account that allows you to set up your Windows 10 computer and install any programs on Windows 10 that you would like to use. Once you have finished setting up your computer, we recommend that you use a standard user account for your day-to-day computing. It's more secure to use a standard user account instead of an administrator account because it can prevent people from making changes that affect everyone who uses the windows 10 computer. 2.) 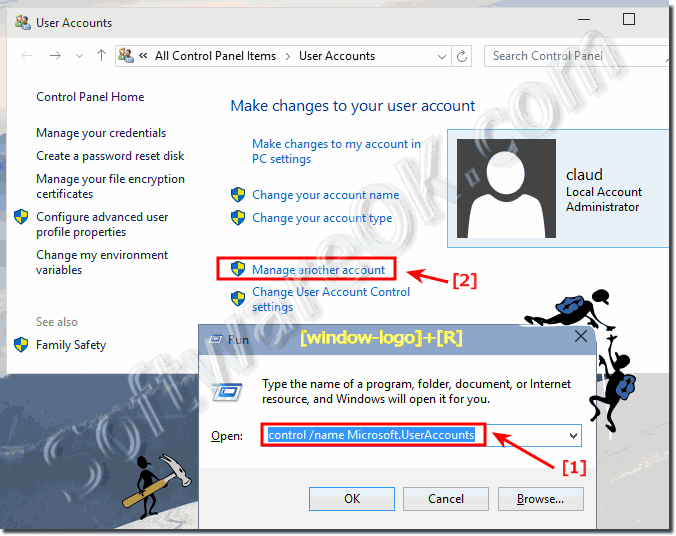 Use User Account Control to change the Windows 10 administrator account! Please start the User Account Control via t control /name Microsoft.UserAccounts command from Windows 10 run dialog! (Image-3) Windows 10 user accounts! Select an User and change account type in Windows-10! 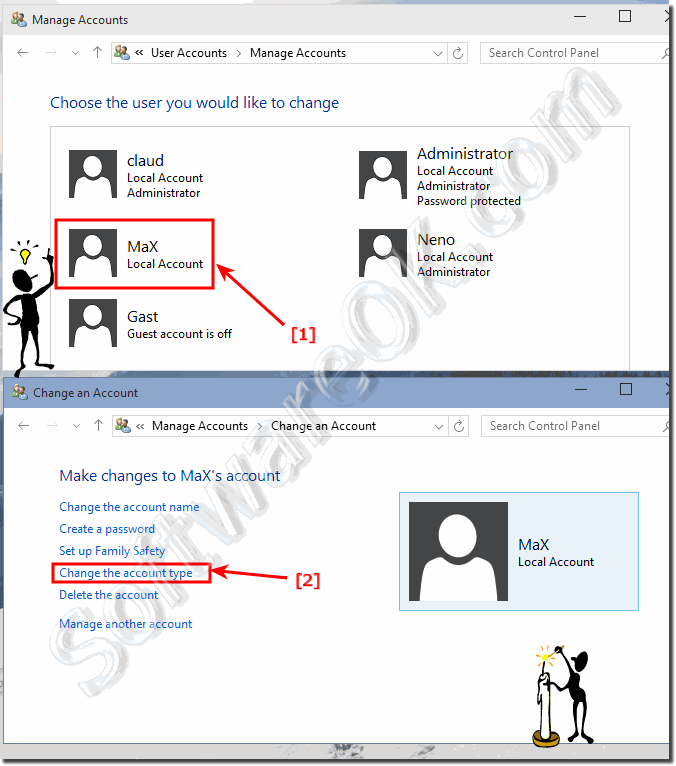 (Image-4) Select user in Manage Accounts windows 10! 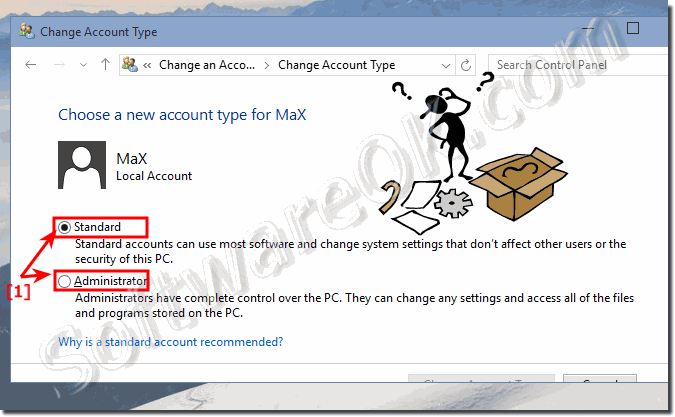 Change the account type in Windows 10! (Image-5) change administrator in windows 10! An Windows 10 administrator is someone who can make changes on a computer that will affect other users of the computer. Administrators can change security settings, install software and hardware, access all files on the Windows 10 computer, and make changes to other user accounts. 3.) 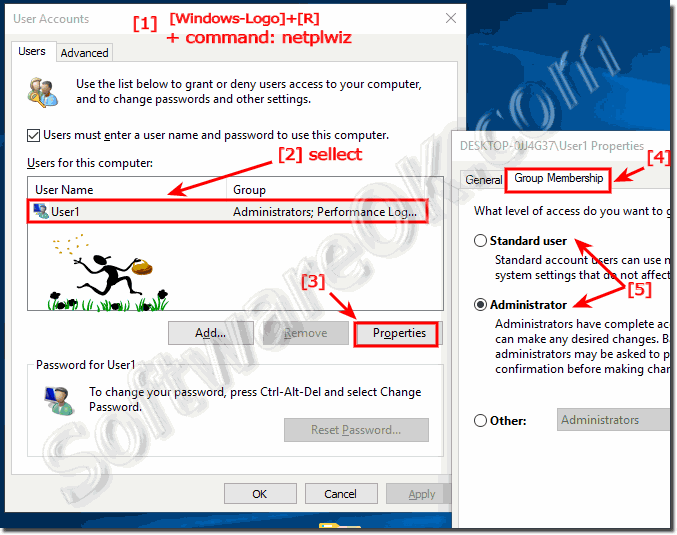 Change User Account to administrator account via netplwiz! Use the keyboard shortcut Windows key + R to open the run command, type command: netplwiz, and press Enter. Select the user account and click or tap the Properties button. Click the Group Membership tab. Choose the account type: Standard User or Administrator.Click or tap Apply Button to complete the task. 4.) Change a user account type using Command Prompt line! Use the Windows key + X keyboard shortcut to start the Windows-X menu and select Command Prompt (Admin). ► Change Screen Resolution in Windows 10, two solutions? ► Change product key in windows 10 for a new activation of Win-10, how-to? ► Change Windows Colors in Windows-10, (title bar, border)! It is simply and easy to switch ergo change the user accounts privileges in Microsoft Windows! And there are really many possibilities open to adapt the user rights and change them at any time! A lot of Windows users are wondering if it is possible to change the administrative user under the new Microsoft operating system Windows 10 that is currently the best and most stable windows of all time, here is the answer to this very important question. You can also use this solution for your Windows Web Server System 2016 and 2012.